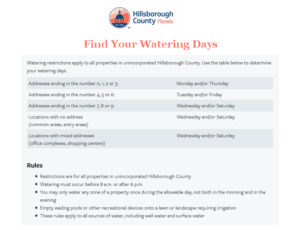 Find your county’s irrigation watering schedule and restrictions to determine when you are permitted to water (days of the week and time of day). For residential homes, watering days are usually dependent upon the last digit of your house number. For HOA communities you may have a specific schedule assigned under a county variance. Decide the start time and the duration time for each irrigation zone or station. Each station or irrigation zone will have usually several sprinkler heads. 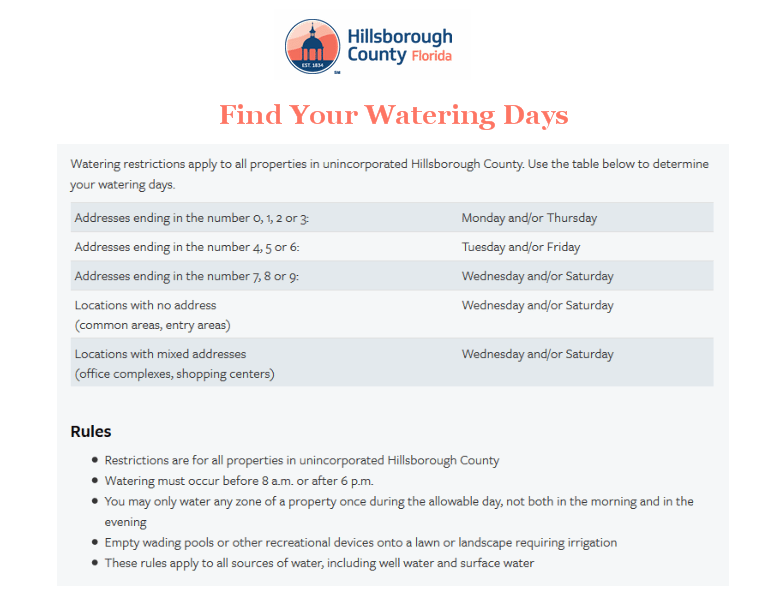 It is important to first check the county rules regarding irrigation watering or you may get a county violation penalty if you are watering during the wrong prescribed times. Watering hours in the Tampa Bay area are usually between 6 PM and 8 AM. These restrictions change from time to time and changes are usually noted in the local newspapers or on the Southwest Florida Water Management District’s website, www.swfwmd.state.fl.us/conservation/restrictions. Ensure the accurate current date and time is set in your Sprinkler Timer box. You will need to manage this for daylight savings time. Some systems may do this automatically. Select the day or days of the week on your Sprinkler Timer appropriate for your property. Set Station Run Time of watering for each zone. The time is usually noted in minutes. Be cognizant that on your property some zones may require more or less water, so you may have to go back and adjust the Station Run Time for those zones to fine tune the amount of water being delivered to those areas. Sprinkler timer will allow you to select a specific station and change the duration time of watering. Example, if after an hour of watering, one of your zones has puddles of water, that zone may need less time and should have the duration modified. It important not to over-water, where the grass is swampy. It’s also important not to underwater, where the grass and soil are not moist and will dry out quickly. If your Irrigation system is equipped with a rain sensor, it’s very important that you verify it is active. The purpose of the rain sensor is to shut off your system when the ground is sufficiently wet from a substantial rain. The rain sensor’s operation can be adjusted depending upon the amount of rain that has fallen. The worst waste of water and money is having your sprinkler irrigation system run while it’s raining. If you sprinkler system or community irrigation system doesn’t have a rain sensor or the rain sensor is not working, call ATZ Irrigation. We can repair your rain sensor or install a new rain sensor, depending on the manufacturer’s sprinkler timer model. Some old models are not equipped to handle a rain sensor, in those cases we replace the sprinkler timer with newer technology to handle the rain sensor. Finally, if you have any trouble setting the time and/or duration, please call ATZ Irrigation for service, it may mean your sprinkler timer is malfunctioning and is in need of repair or replacement. If any one of the sprinkler heads are broken, leaking, or maladjusted, please don’t hesitate to call ATZ irrigation for sprinkler repairs or a sprinkler system checkup.